Read the full review of Music Complete here. It’s fair enough to say that a vibrant, 30-year-plus career of electronic dance music was not the trajectory that fans of Joy Division anticipated for the iconic post-punk band upon Ian Curtis’ untimely death in 1980. 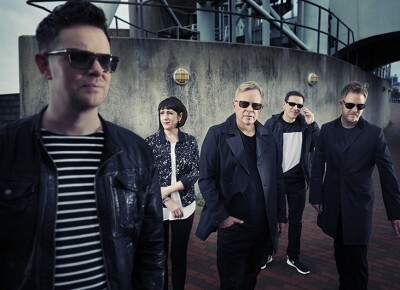 Pressing on into uncharted territory as New Order, the group carefully tempered their atmospheric guitar sound with avant-garde electronic influence from the likes of Deutsche-robots Kraftwerk and the Italo disco legend Giorgio Moroder, crafting a popular yet innovative oeuvre that defined a generation. Fast-forward 35 years—past all the albums, singles, videos, world tours, hiatuses and accolades—to 2015 and Music Complete, the group’s most engaging album in two decades. Music Complete is the group’s first album since the departure of original bassist Peter Hook in 2007, and the first with original member Gillian Gilbert since 2001’s Get Ready. From the Peter Saville–designed cover—a neon sigil for a new zeitgeist—to the production work from Tom Rowlands and guest spot’s from Iggy Pop, Brandon Flowers and La Roux’s Elly Jackson, Music Complete showcases a band with plenty left to say. The album’s lead single and opening track, “Restless,” suggests as much, packaging Bernard Sumner’s frustrations with the state of the world in a lush envelope of symphonic guitar pop that feels as though it hasn’t been opened since 1993. Sumner’s observant critique doesn’t let up for “Singularity,” a tune infused with palpably darker, more brooding tones propelled by ominous bass and squelching modular-synth patches. “Plastic” lifts the menacing shade with dance-y synth pads and more playful, flippant lyrics: “You’re so special / so iconic,” sings Sumner, with the aid of a soulful back-up singer. Read our interview with New Order’s Gillian Gilbert and Tom Chapman from our September issue! While longtime fans may decry Music Cmplete’s highly marketed guest spots as a gimmick—or worse, a crutch—they’re actually quite enjoyable. New Order uses Elly Jackson’s (La Roux) contributions to great effect; “People on the High Line” is sublime, disco-groovy perfection, salved with Jackson’s smooth backing vocals. As the album’s most upbeat—dare I say—fun track, “Tutti Frutti,” employs Jackson’s mighty vocal talent for a dancefloor-ready banger. 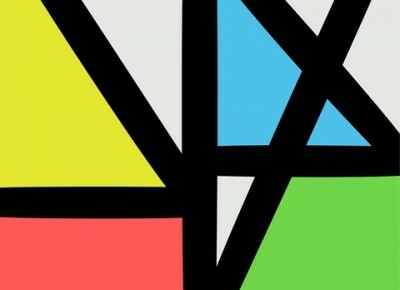 If any track could unite the disparate camps of New Order fans, this is it. Brandon Flowers’ anthemic yelp on the album’s closer, “Superheated,” is suitable, but not nearly as likable. While Jackson and Flowers are fresh-faced youngsters who prove to invigorate the stylings of New Order, Track 6 proves to be a collaboration nearly 50 years in the making. When a haunting whirr of crickets washes over listeners’ ears on “Stray Dog,” the album wanders from observant pop song and dance to a biting spoken-word prose poem provided by none other than the stray dog of rock n’ roll himself—Iggy Pop. Reciting the Sumner-penned lines, Pop’s gravel-throated drawl inflects the track with chilling perspective. The moment is dark, darker than the melodrama of all of New Order’s previous work, and finds them breaking ground in bold new ways—it’s a transitional point for the album and a pivotal one for the group. Pop’s influence has percolated in the group’s work previously, most strikingly as a major influence on Joy Division’s nihilistic performance attitudes; additionally, Pop’s 1977 Bowie-produced album The Idiot is said to be the last album Curtis played before hanging himself. By joining forces with the icon himself, the group grips the shrouded memory and takes it with them, pushing forward, never turning back for longer than what it takes for them to know what propels them forward. For fans lamenting the departure of “Hooky,” there is plenty of musical mastery marinating the album. Though Music Complete strays from the zeitgeist of the 1980s, newer members Phil Cunningham and Tom Chapman bolster the tracks with a solid guitar and bass backing, sinewy enough to complement Stephen Morris’ god-like rhythm capabilities, deft enough to convince listeners that there might be a new peak to this band’s lengthy career. Pulling themselves out the mire, Music Complete’s Act II solidifies group’s iconic status—tipping the scales with anthemic tracks like the “Regret”-esque “Nothing But a Fool,” the dance shuffle of “Unlearn This Hatred” and “Superheated.” Spanning 11 lengthy tracks, Music Complete is a solid effort from start to finish—I couldn’t find a track that didn’t charm me after repeated listens. Overall, the sheer variety of dance, electronic and post-punk flavors on Music Complete is a bold statement for a band that could easily stick to their roots, but the poise and exhilaration with which these legends compose each new note ultimately solidifies Music Complete’s success.